Lucky bamboo is a popular houseplant that is thought to bring luck to its owner. It is associated with feng shui. It is hardy and grows with little light. As long as it has water, it's happy. Despite its centuries-old name, Lucky bamboo is not a bamboo at all. It is in the lily family and goes by the name Dracaena sanderiana. Lucky bamboo is native to rain forests in Asia and Africa. To add visual interest, you can weave lucky bamboo into several shapes, including spiral and braids. It's a process that takes time. 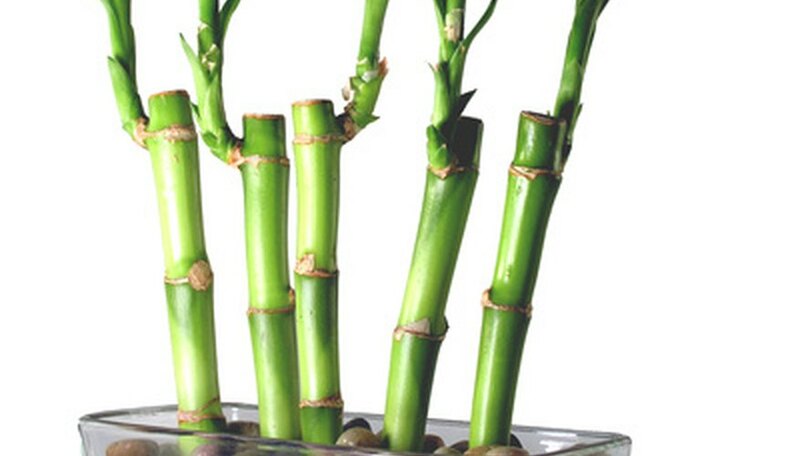 Use young stalks of lucky bamboo for training because they are easy to manipulate. Choose healthy plants with a vibrant green color. Examine the roots to make sure they are growing well. You want a mass of fine roots that travel outward from the bamboo. If the roots are tight and tangled, do not use them for weaving. Choose three or four stalks that are shorter than 4 inches each. Spread a 1-inch layer of filling at the base of the container. Use beads, pebbles, ceramic chips or small pebbles. Make sure the layer is even and level. Place the bamboo plants in the container so the bottom of the stalks are buried in the filling. Make sure the roots are covered with the media. Space the bamboo stalks 2 inches from each other. Fill the container with filtered, non-chlorinated water to cover the roots and bottom of the stalk. The water should reach to just below the rim of the plant pot. Force the lucky bamboo plant into a twisted, spiraling or curved shape by altering its exposure to light. Lay the plant on its side, with one side facing the light source. Cover or shield the other three sides so the plant is forced to grow toward the light and against gravity. Rotate the plant after it grows in the desired direction to encourage it to grow in a new direction, making the spiral form. This is a slow process. Weave braids as an alternative to spiral or curls. Manipulate the stalks across each other by laying the container on the appropriate side and letting the plant grow toward the light. The stalk on the left should be forced to cross the center stalk. Then, the right stalk should cross the center. Continue until you have a braid weave pattern. Trim the bamboo as needed to keep it manageable. Tie florist tape around the crosses and twists to keep them in place. Cut off the excess tape. Keep taping the joints as they take shape. Always be gentle when weaving bamboo. You can cause damage if you're too rough. Flower Shop Network: What Happens When Lucky Bamboo Outgrows Its Braids?